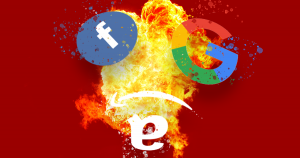 Senator and presidential candidate Elizabeth Warren announced a bold plan on Friday to break up tech giants Amazon, Facebook, and Google. In particular, Warren singled out “anti-competitive mergers,” such as Amazon’s ownership of Whole Foods and Zappos, Facebook’s WhatsApp and Instagram, and Google’s Waze, Nest, and DoubleClick. “Unwinding these mergers will promote healthy competition in the market? — ?which will put pressure on big tech companies to be more responsive to user concerns, including about privacy,” Warren wrote in the post. It’s not unprecedented for the U.S. government to break up large enterprises. In the 1980s, it divided the American Telephone and Telegraph Company into so-called “Baby Bells” — several of which later re-merged into Verizon. Warren also alluded to how huge tech interests have upset the balance in the marketplace of ideas, noting how state actors may have used Facebook and other platforms to try to influence the U.S. presidential election in 2016. The post Elizabeth Warren Shares Plan to Break up Facebook, Google, Amazon appeared first on Futurism. This entry was posted in Liberty by admin. Bookmark the permalink.